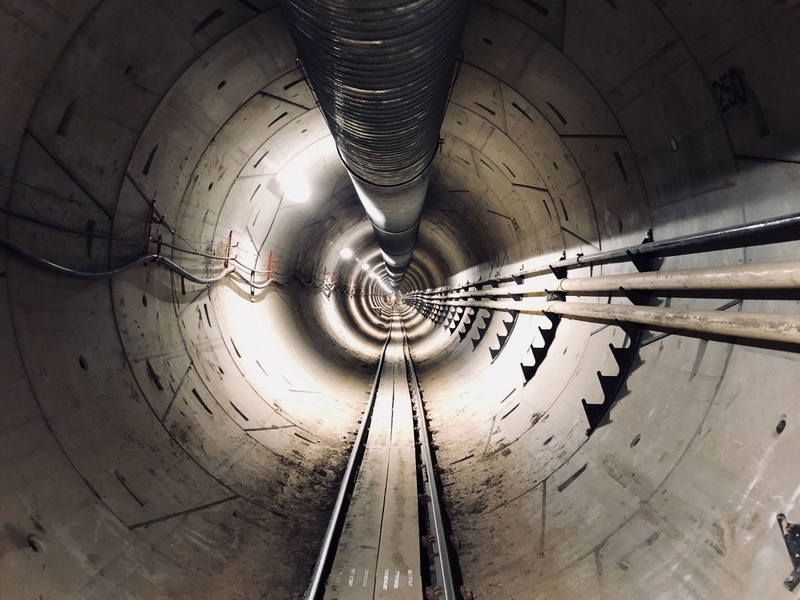 Elon Musk last month said his tunnel construction company was nearly finished with its proof-of-concept, a two-mile-long tunnel that stretches from SpaceX’s headquarters in Hawthorne, California, to an LA suburb. Over the weekend, Musk walked the full length of the tunnel and shared video of it on Twitter. Musk described it as “disturbingly long,” adding that the project is still on track to open on December 10. The company will be offering free rides to the public the following day. Musk, fed up with LA’s nightmarish traffic, declared on Twitter in late 2016 that he was going to build a tunnel boring machine and “just start digging.” Many thought it was a joke but with Musk, it’s hard to know when to take him seriously. As it turns out, the plan was very real and now just two years later, we’re a month away from seeing the first prototype tunnel. It is believed that the tunnels will use autonomous, electric “skates” to zip passengers along a track at speeds of up to 155 mph. According to reports, as many as 16 passengers could fit on a single sled. If successful, the tunnels could help to alleviate traffic headaches in LA and other large cities. Musk is so great at hyping people up; he's got this Steve Jobs like aura people just seem to gravitate to wards. I wonder how much of what he does is for the sake of humanity and how much is for his own desires to be a 'legend'. Seems to me focusing on Mars colonization rather than Moon colonization is much more for the sake of taking another 'giant leap' rather than being practical. The man has some cool ideas, and some of them really work (SpaceX has gone way further than I would ever have imagined), but some of his ideas are bad (like the hyperloop). I wish there was a way of cutting through the crap that is Elon's twitter. I wish there was a way of cutting through the crap that is Elon's twitter. There is a way. Simply realize everything he does or says is hype, and ignore him entirely. He's a fraud and a professional liar, just like Jobs was. Uncle Al and wiyosaya like this. Musk has walked back his Mars plans. As to whether or not he wants to advance humanity or himself through Mars colonization, consider the fact that he has said that any people he sends to Mars should plan on staying for the rest of their lives as he will not offer them a way home. To me, that is very telling. Also note that NASA is working with Bezos on the Mars project - https://www.geekwire.com/2018/blue-origin-gets-nasa-studies-resource-utilization-moon-mars/ and I do not know for sure whether NASA is also working with SpaceX in a similar fashion. If not, IMO, this says volumes WRT what NASA thinks of SpaceX and Mars. Unlike Musk's Mars plans, NASA is working on a means to return anyone it sends to Mars back home - see this TechSpot article https://www.techspot.com/community/topics/nasa-is-building-robots-to-make-rocket-fuel-on-mars.250154 it is not the only article out there on NASA's efforts. Musk has walked back other pie-in-the-sky ideas, too, like his satellite Internet initiative. I find it interesting that in the case of this project, it has taken two years for them to build a two-mile long tunnel. Personally, with the wavy looks of the tracks in the tunnel in the first picture in this article - especially if these are the tracks that will run the carriers, I would be extremely reluctant to get on a carrier that is intended to travel at a speed of 155 mph. IMO, Musk blows a lot of hot air. He blows a lot of hot air but he also gets a lot done, just like Jobs did. If these people weren't pushing their industries ahead, the rest of the apparently non-blowhards would just be lazily doing the bare minimum to make decent profits and we'd still be running everything from command line and the only game in town for launches would be the Russians. Reehahs and Bannhammer like this. ..............................…...…….........….I find it interesting that in the case of this project, It has taken two years for them to build a two-mile long tunnel. Personally, with the wavy looks of the tracks in the tunnel in the first picture in this article - especially if these are the tracks that will run the carriers, I would be extremely reluctant to get on a carrier that is intended to travel at a speed of 155 mph. The world would still spin on its axis if Musk were not around. Yes, but less would get done. People like Musk both push for implementation of new tech and act as figureheads for younger people to become interested in getting in to these job sectors. As an example, I prefer space-based money to be spent on non-manned missions as they very clearly have a much higher science return for the buck than manned missions. But manned missions get people dreaming and committing to space careers. We need both. Musk is a man that gets stuff done. Calling him a liar isn't far from reality. But I would consider his success to far exceed the crap that gets flinged out. To dismiss his achievements so easily really makes a weak argument. In this case, the tunnel had many obstacles to overcome. Research to be done with every aspect of the dig. R&D is a big deal to be able to do this cheap, fast and safe as they have attempted many ways of gaining this task. I think that this comment may generate flak for anyone out there with an opinion. So take it with a grain of salt. You don't have to agree with me. Elon Musk to me is a pioneer of new and interesting humankind. He takes on challenges and tackles them. Consequently he takes a lot of flak for not being to solve some big issues in the timeframe he had hoped for. So think to yourself, why hate the guy for trying when so many people don't even bother to try? Am I the only one that thought of this reading the article? Obviously, you are both entitled to your opinions. As I see it, Musk has trouble getting things done. As far as R&D for the tunnel? It is a mature technology, and has been for a long, long time now. Neil is a great science communicator but frankly, the more the merrier. Eagerly anticipating the second season of Cosmos in 4 months! OK, technically third. As I see it, Musk has trouble getting things done. Like I say to Cranky, that is no different than any other business which evolves by innovation. Even if that innovation is piecing everyone else's work together. In this day and age there is likely no way for anyone to build, without borrowing idea's. Taking into account that a "Fraud" got to be the president of your country, it must hurt not finding a real way to dismiss a Self Made Millionaire, that keep doing and getting what he wants, even sending rocket to the space in a rate that NASA has never ever imagine to do. So, Trump is you president and Musk is you top of the line entrepreneur (now that Jobs is Dead), please take a sit, and try to find a real way to talk bad about him, stop repeating the "Fraud" claim, starting to look like fox News News. You act as though the last guy who thought he was President wasn't a fraud. Just ask Boston how tunnels improved their commutes. What about option number two against Trump. I'm guessing he wasn't thinking about Hillary either. I was, but, in reality, how can people keep telling them self that someone fighting against all odds and emerging victorious is a "Fraud". I mean, realistically speaking (I watched the whole electoral process, as everyone might know, US impact most of the 3rd countries in America, and I live in one of them), what would people like that be saying about Hillary nowadays? What would they be saying about Sanders?. Yeah, that gets to me as well. This idea was first proposed in 1863 in London. It's a little thing called the tube. LA doesn't have a subway so Musk decided to build one. Yes, they do. They're part of the Metro Rail system.